This is my 1st post on my blog, so as I am thinking what to write about. I figure some of the readers may be wondering who is this girl Evelyn Brooks and should know about Evelyn Brooks Designs, too, right?! 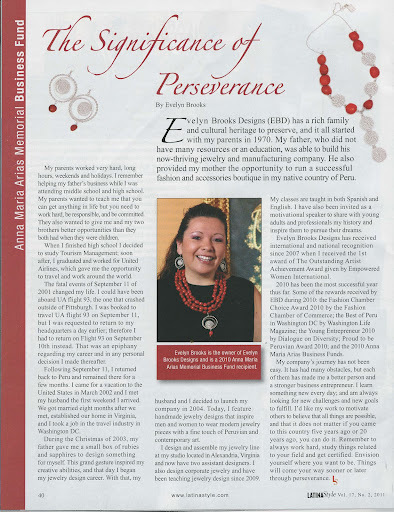 Evelyn Brooks Designs has a rich family and cultural heritage to preserve, and it all started with my parents back in 1970. My father, who did not have many resources or education, was able to build his now-thriving jewelry and manufacturing company. He also provided my mother the opportunity to run a successful fashion and accessories boutique in my native Peru. My parents worked very hard, long hours, weekends and holidays. I remember helping my father’s business while I was attending middle school and high school. My parents wanted to teach me that you can get anything in life but you need to work hard, be responsible, and committed. They also wanted to give me and my two brothers better opportunities than they both had when they were children. When I finished high school I decided to study Tourism Management; soon after I graduated I began to work for United Airlines which gave me the opportunity to travel and work around the world. The fatal events of September 11th of 2001 changed my life. I could have been aboard UA flight 93, the one that went down outside of Pittsburgh. I was booked to travel UA flight 93 on September 11th, but I was requested to return to my headquarters a day earlier; therefore I had to return on Flight 93 on September 10th instead. That was an epiphany regarding my career and in any personal decision I made thereafter. Following September 11th I returned back to Peru and remained there for a few months. I came for a vacation to the United States in March 2002 and I met my husband the very first weekend I arrived. We got married eight months after we met, established our home in Virginia, and I took a job in the travel industry in Washington DC. During the Christmas of 2003, my father gave me a small box of rubies and sapphires to design something for myself. This grand gesture inspired my creative abilities and that day I began my jewelry design career. With that, my husband and I decided to launch my company in 2004. I feature handmade jewelry designs that inspire men and women to wear modern jewelry pieces with a fine touch of Peruvian and contemporary art. I design and assemble my jewelry line at my studio located in Alexandria, Virginia and now have two assistant designers helping me. I also design corporate jewelry and began teaching jewelry design since 2009. My classes are taught in both Spanish and English. I have also being invited as a motivational speaker to share with young adults and proffesionals my history and inspire them to pursue their dreams. Evelyn Brooks Designs has received international and national recognition since 2007 when received 1st award The Outstanding Artist Achievement Award given by Empowered Women International. The year 2010 has been the most successful year thus far. Some of the rewards received by EBD during 2010: the Fashion Chamber Choice Award 2010 by the Fashion Chamber of Commerce; the Best of Peru in Washington DC by Washington Life Magazine; the Young Entrepreneur 2010 by Dialogue on Diversity; Proud to be Peruvian Award 2010; and the Anna Maria Arias Business Funds 2010.I was invited to write the articule you have just read for Latina Style Magazine.